RACING north up Route 180 in Arizona, ahead of a storm moving in from California, I drove through the gray-green Kaibab National Forest and Coconino National Forest. Ponderosa pines stood sentry-like, to the accompaniment of radio warnings of snow - 16 inches in Flagstaff, where I'd come from, and 10 inches where I was headed, the South Rim of the Grand Canyon. A family of wild turkeys strutted alongside the road just before the woods gave way to a rolling expanse of scrub country covered with patches of snow. Blue sky alternated with bands of thick, billowy clouds casting a pearly luminescence and concealing the San Francisco Peaks, which normally dominate the eastern horizon. Then, before the snow could catch me, I was there -at the entrance gate of the Grand Canyon National Park. Minutes later, I stood on Mather Point, 7,000 feet in elevation, gaping at the edge of the canyon. No matter what the season, the canyon always takes your breath away. In winter, a trip to the Grand Canyon is all about weather - cold, foggy and rainy; warm, clear and sunny; frigid and blindingly snowy - not only on the highways and at the airports that provide access to the canyon, but also in the park itself. At Mather Point that day, the air was crisp and the sun pierced the clouds so that shafts of light illuminated the vivid colors of the rock layers in the canyon walls. Below the rim, where the cliffs and the slopes of the upper canyon descend into the V-shaped inner gorge, snow blanketed the landscape at higher elevations and merely flecked it lower down. At the bottom, roughly a vertical mile below the rim, flowed the sinuous Colorado River. Back up top on Mather Point, tourists piled out of buses and S.U.V. 's, chilly but delighted, busily snapping pictures and exclaiming over the views. 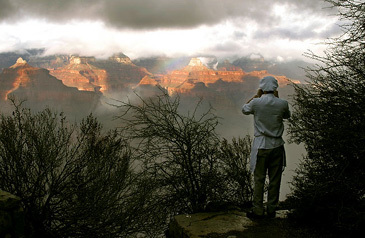 In winter, dramatic and rapid weather changes at the South Rim can make canyon-watching an extreme sport. You can experience four seasons within minutes at Mather Point, going from sunny and mild to a blizzard that obliterates the whole scene and leaves you clutching the overlook railing, enshrouded in a whiteout. "You can be standing inside a snowstorm with zero visibility when suddenly the storm moves along and you can see all the way to the bottom of the canyon," said Ronald Brown, a ranger in the park. "Sometimes the snow melts as it falls, or the fog will be so thick you can't see the closest rocks. Once in a great while there's an inversion: you'll be standing at the rim with only the tops of the highest rock formations visible. Everything below you is filled with clouds so thick it looks like you could walk right out on top of them." Still, even in winter, this is sunny Arizona, where that great ball of light in the sky beams down about three of every four days, said Mark Stubblefield, a National Weather Service meteorologist. At the canyon, about half the days in cold months are sunny or partly sunny. A typical pattern is a snowy or foggy day followed by a clear one, as wind from the storm brings in fresh clean air. Because the hordes thin out once the temperature drops, there is less jostling for space at the overlooks than in summer and there is less need to pass slowpokes on the trails. 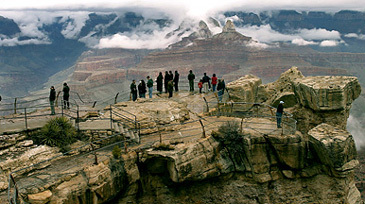 The National Park Service said that of the 4.67 million people who visited the canyon in 2004, 162,059 arrived in February, compared with 677,633 in July. "The snow makes the canyon look clean and bright," Mr. Brown, the ranger, said. "When clouds and shadows are moving through the canyon and snow is reflecting light off the rocks, it's more breathtaking than usual." Straight across the canyon from Mather Point is the North Rim, 1,000 feet higher and about 10 air miles away, but more than 200 miles by car and a 21-mile, two-to-three day, cross-canyon hike. From mid-October to mid-May, the North Rim is closed because of snow, but the South Rim remains open year-round (the Park Service keeps the roads clear). Another advantage of visiting the canyon in winter is that fewer travelers mean fewer helicopters and small planes buzzing overhead, spoiling the peace and quiet. During my three-day stay, I saw no aircraft, though they do operate all year. Tour buses still come to the canyon in the cold months, but in far fewer numbers, and from December through February visitors can take their own cars onto the Hermit Road, which begins in Grand Canyon Village and dead-ends eight miles to the west. As I drove it, stopping at overlooks, the tempest hit, so I opted to wait it out at Pima Point for that once-in-a-lifetime view of Granite Rapid 5,000 feet below. Post-storm, standing on the narrow promontory that forms Maricopa Point was like being on the prow of a ship that had set sail into a sea of swirling reds, pinks and salmons, the shades of the canyon's epic towers, buttes and pinnacles. Another 360-degree prospect awaited at Hopi Point, where bands and patterns of color in the cliffs - black bleeding into mustard-yellow, orange melding into coffee-umber-cinnamon-terra-cotta - danced and shimmered in the shifting light. The Grand Canyon, it seems, must be the mother piece of Southwestern pottery, inspiring generations of Indian artists. At Mohave Point, you can see the Colorado River both coming and going, as it were, from east to west, a skein of muddy-hued water unspooling through the canyon. 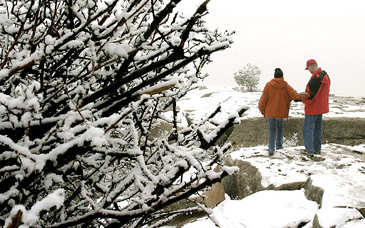 ARIZONA SNOW A couple tours the South Rim, where wintry fog can be followed by brilliant sun. I also drove Desert View Drive, which curves along the South Rim for 25 miles from the park's southern entrance to its eastern one. At Lipan Point, windy sheets of freezing rain and snow pelted me, but I hung in there until the ceiling lifted, revealing both a rainbow and the tableland of the Navajo Reservation, ending abruptly at Palisades of the Desert, the sheer bluffs that form the Grand Canyon's eastern wall. Here the Colorado River turns west and enters the black-schist inner gorge. Above, the broad Tonto Platform, consisting mostly of green-gray shale, spreads like a mossy carpet over the canyon. At every stop I made along both roads, and during my hikes, I encountered people madly trying to record the moment, either by filming the canyon with a camcorder or by taking photographs. But no camera lens is long or wide enough to capture the canyon. After a while, you have to stop looking through the viewfinder and gaze unblinkered at the constantly changing panorama. Only then will you realize that the Grand Canyon is the perfect scale. If it were any deeper or wider, it would be an abyss, and if any smaller, it would lose much of its monumentality. EAGER to see the Colorado River close-up, but not via a boat or a two-day trek on foot, I drove southwest under a bright sun for about 140 miles from the South Rim to Peach Springs, 5,000 feet in elevation and the capital of the Hualapai Reservation, on Historic Route 66. Diamond Creek Road, which requires a four-wheel-drive vehicle even in the best of weather, heads north out of town, dropping 3,000 feet in elevation as it winds 20 miles through Peach Springs Canyon, one of the Grand Canyon's many side canyons, right to the river. As the only road that runs to the floor of the Grand Canyon, it presents a singular view, especially for those who have seen the canyon only from the South Rim. Evidence of how green Arizona's desert is - even in winter - surrounded my car as I descended through Peach Springs Canyon. Prickly pear, barrel and spiny cactus, agave and yucca plants, and other desert shrubs climbed far up the canyon walls as they rose all around. The sky was overcast, so the colors were more muted than they had been at the South Rim. Yellow-green willows and cottonwoods appeared as the road crisscrossed Diamond Creek and then, around another bend or two, ended at a beach - mile 226 of the Colorado River's 277-mile course through the Grand Canyon. The river rushed by, its strong current whooshing over a bed of boulders that ran from the shore to midstream. Its chilly waters, at their winter temperature of 40 degrees, were hardly colder than in summer, when the water temperature through the floor of the canyon rarely rises above 45 degrees. Since 1964, the release of water from Glen Canyon Dam, 15 miles upstream from the park, has controlled the Colorado's flow through the Grand Canyon. Even so, the river projects its wildness. The Grand Canyon as a whole, in fact, often leaves visitors overwhelmed by its power. No matter what time of year you go, the canyon stands immutably, despite all the miners and other adventurers who have tried to exploit its resources and failed. It is a place of beauty and rawness that must be appreciated simply for what it is. VISITORS to Grand Canyon National Park can fly into Flagstaff, Ariz., (80 miles away), Phoenix (230 miles away) or Las Vegas (280 miles away). The Grand Canyon Railway (800-843-8724; www.thetrain.com) runs vintage diesel and steam passenger trains from Williams, Ariz., (65 miles away) to the South Rim. One of the best hotels on the South Rim is the rambling chalet-style El Tovar, built of logs and native stone in 1905 and exuding a rustic charm. It is being renovated; when it reopens April 13, rates will be $123 to $285. A five-minute walk down the Rim Trail from El Tovar, with equally impressive canyon views, is the 1935 Bright Angel Lodge, which has a history room crammed with memorabilia from the park's early days. Guests stay in small cabins or motel-type rooms. Rates are $49 to $240. Information on both hotels is available at www.grandcanyonlodges.com or by calling (888) 297-2757. Camping, hiking, biking, mule trips, horseback riding, flight-seeing, snowshoeing, cross-country skiing and ranger programs are all wintertime options, weather permitting. Just about the only activity not available now is Colorado River rafting; the season begins in mid-April. For more information about any of these activities, visit www.nps.gov/grca. The Grand Canyon Field Institute (866-471-4435; www.grandcanyon.org/fieldinstitute) offers classes ranging from geology to cultural history.